Small child back pack. This comes in SO handy when you just need carry a few things, esp on tours. Pack it with souvenirs to bring back from Cancun. Tums, Immodium, Pepto. Stomach issues are common. Swimsuits & Sarong. If you don't have a swimsuit, you can buy good ones at the mall or cheap ones at Walmart. Less is better. If you don't NEED it, don't bring it. Stores here in Cancun have most things you might want. If there is a certain kind / brand of something you enjoy, bring it. Tea, coffee, cigarettes, etc. While you can surely find something similar here, if you only want your brand then bring it with you. Biodegradable Sunblock is hard to find in the states. Order it here and have it waiting for you in Cancun. No need to bring towels if you are staying in a resort. 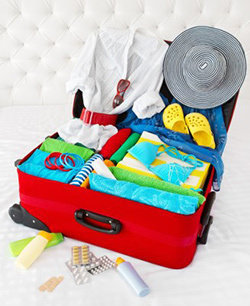 Pack bathing suits, lotion, and other beachwear at the top in your luggage so you can access them in case you arrive at the resort before regular check-in time. It will be the first thing you need! Generally Cancun is very casual, but you will want a nice outfit or two for clubs and nicer restaurants.